tommEE pickles blog of illusion: Ooh and it's football season too. Time to create magic. Ooh and it's football season too. Time to create magic. Check out the website. The pages look like pages from an ancient tome, complete with hand-drawn illustrations and crinkly, yellowing paper. The wand itself is a simple stick. It’s a stick containing an infrared LED. In practice mode, you can try out any of the 13 gestures and the wand will vibrate and pulse a coded pattern to let you know which one. When you are ready to do some serious magic (change channels), the wand learns simply by performing a gesture and beaming a boring, modern-day remote at its tip. Change channel by flipping left or right, for example, or increase the volume with a quick clockwise twirl. 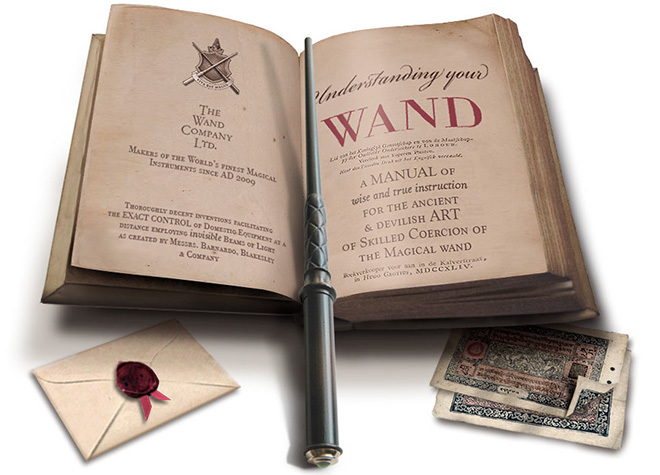 The wand will be available on October 1st for £50, or $83, batteries included.